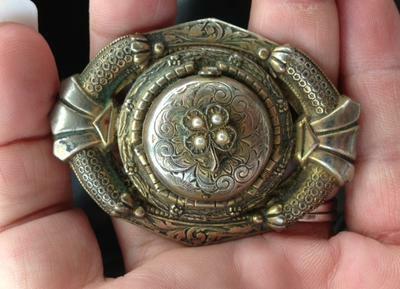 Hoping someone can tell me a little more about the brooch I purchased this week at an estate sale. 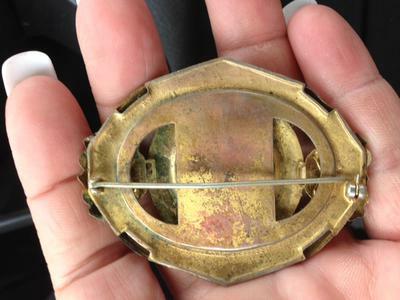 The clasp on the back suggests 1930 or newer... and that's about the extend of what I have been able to figure out (obviously a novice here). The people working the estate sale didnt know anything about it either, It was so unusual that I had to purchase it. 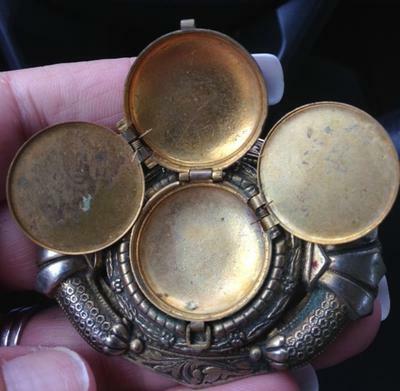 To me, it has almost an Egyptian feel around the edges... then it has the center piece that looks kind of like my grandfather's western styled pocket watch.... then a shamrock sitting on top of the whole thing! That was all before I realized it opened and has places for 4 photos. No matter what it is, i love it... but it definitely has me curious.